The tiny Himalayan country of Bhutan may be one of the smallest nations in the world, but its recent decision to convert its agricultural production entirely to organic could have enormous implications for agricultural practices around the globe. 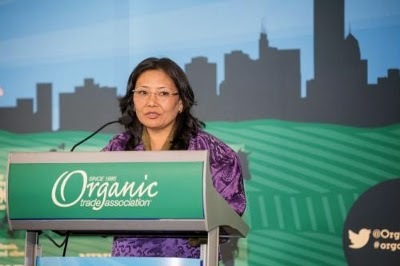 Traveling halfway across the world to speak at the Organic Trade Association's (OTA's) annual Policy Conference in Washington today, the Bhutanese official who is overseeing the nation's transition to organic told attendees at the OTA conference that converting to organic agriculture is critical for Bhutan's future. "Why organic is important for Bhutan is more about survival, sustainability," said Bhutan's National Organic Programme Coordinator Kesang Tshomo. "Bhutan was carved out of the mountains…organic will help ensure that people survive in the mountains and that we preserve our bio-diversity." Bhutan made headlines in 1971 when it implemented a new criteria for measuring progress known as the Gross National Happiness, or GNH. Instead of measuring the amount of goods and services produced by a country to determine its success, Bhutan measures the spiritual, physical and environment health of its people and its land. Then in 2012, Bhutan catapulted to the front page again when its government announced that the small landlocked kingdom nestled between China and India would become the first nation in the world to convert to 100 percent organic farming. While only around 3 percent of Bhutan's territory is actual farmland, an estimated 80 percent of Bhutan's 700,000 population makes its living off agriculture, as mostly small subsistence farmers. Bhutan's major crops are maize and rice. It also grows wheat, barley, potatoes, oranges, apples and other orchard crops. It produces such specialty crops as rare varieties of mushrooms, which it exports to Japan. Bhutan's decision to transition to 100 percent organic was both practical and philosophical. Because the terrain is mostly mountainous, the use of chemicals has a strong impact on the country's water and environment. The nation is one of the most bio-diverse areas on earth, and it has long held conservation and good stewardship of the environment as a national priority. Finally, a long-term goal is to improve the livelihood of Bhutan's farmers, help them be more productive, and reduce Bhutan's food imports. But even in a country as small as Bhutan, converting to total organic agriculture requires the commitment and investment of the government. To that end, Bhutan has launched a region-by-region, crop-by-crop approach that other nations interested in boosting their organic agricultural sectors are watching. If it achieves its goal, Bhutan could set an example in how to successfully make organic a national and doable priority. Tshomo's speech was part of a busy program offered here today by OTA at its annual Policy Conference. Early in the day, U.S. Senator Debbie Stabenow (D-MI) was awarded OTA's Public Servant Award for her long commitment to the organic industry. Stabenow praised the organic industry's success in the U.S. market, and in the passage earlier this year of the farm bill, in which the organic industry achieved all of its priorities. U.S. Secretary of Agriculture Tom Vilsack spoke to the conference, and said that it is important for the Agriculture Department to take a role in helping to advance organic agriculture. He said that rural America is struggling, and new opportunities need to be explored, including transitioning to more organic. On Thursday, OTA members will participate in Hill Visits to more than 130 congressional offices to advocate for policies that support the organic industry and organic agriculture. The Organic Trade Association (OTA) is the membership-based business association for organic agriculture and products in North America. OTA is the leading voice for organic trade in the United States, representing over 6,500 organic businesses across 49 states. Its members include growers, shippers, processors, certifiers, farmers' associations, distributors, importers, exporters, consultants, retailers and others. OTA's Board of Directors is democratically elected by its members. OTA's mission is to promote and protect the growth of organic trade to benefit the environment, farmers, the public and the economy.